Shivaji is the founder of Maratha dynasty and a warrior king of Maharashtra. He is also known as Chhatrapati Shivaji Maharaj. He had 8 wives in total. Chhatrapati Shivaji was born in the Shivneri Fort in Maharashtra on 19 February 1630. At 15 years, he conquered the Torna Fort. The Chakan fort and the Kondana Fort were taken by bribing the Adil Shahi governor.Raje Shivaji, Raje Shivaji killed him with Tiger claws. He became the biggest enemy of Mughal Emperor Aurangzeb.1674 he declared himself as a king. 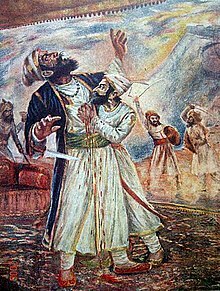 In late March 1680, Shivaji Raje fell ill with fever and dysentery disease, dying around 3–5 April 1680 at the age of 52, on the eve of Hanuman Jayanti. Rumors followed his death, with Muslims believing he had died because of a curse from Jan Muhammad of Jalna. Some also believe that his second wife, Soyarabai, poisoned him so that his crown might pass to her 10-year-old son Rajaram. ↑ "Biography of Chhatrapati Shivaji Maharaj (Shivaji Raje Bhosale)". Important India. Retrieved 9 September 2016. This page was last changed on 5 March 2019, at 12:21.